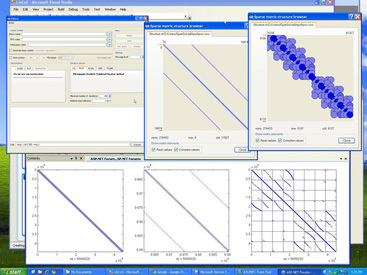 LinCoS™ is a high-performance, parallel iterative solver intended for the solution of large linear systems of algebraic equations with complex coefficients. LinCoS was developed for the solution of linear systems arising from the discretization of Helmholtz and Maxwell equations. Special internal data structures have been implemented to efficiently process computations of complex numbers. These special data structures are twice as fast on basic operations in comparison with standard data structures implemented on the class "complex <double>" from C++. LinCoS is available in both serial and parallel versions, but has been optimized for distributed computational systems (clusters) employing an MPI-based architecture to provide highly-efficient and exceptionally scalability.